IFS seems to oppose change. 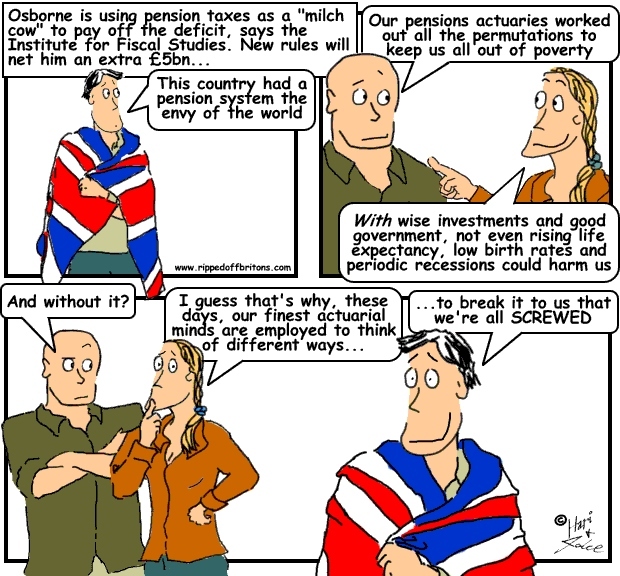 I think Pensions Tax Relief (PTR) should be substantially reduced but not in this way. 1. We are currently BORROWING £70bn pa ie deficit. While borrowing to invest in infrastructure (which will give a higher return than interest rate paid) often makes sense, borrowing for day to day expenditure indefinitely, does not. 2. £50bn (including NI losses, HMRC & CPS figs) of deficit is to pay for the well paid to have their pensions funds topped up with tax-relief. Surely this is grotesquely unethical while support for poor is being cut? 3. Much of the cost of PTR does NOT end up in pension fund anyway, but goes in commissions, charges, fees which are largely ignored because the PTR SUBSIDY distracts customers and obfuscates the pension savings purchase process, effectively removing real competition from the market place. 4. The subsidy thru PTR is, therefore, effectively a govt. hand-out to the bloated, inefficient, uncompetitive financial services sector to the tune of £50bn pa. If it were substantially reduced, they would HAVE to create much leaner savings mechanisms to provide for retirement - with more flexibility and lower charges. 5. This would reduce the impact of PTR cuts on final pension funds. 6. In addition, as deficit is reduced and we start to pay off the debt, UK interest payments would drop - could facilitate tax cuts enabling those who choose to, to save more for a pension. 7. In short- PTR mainly benefits the Financial Services Sector & NOT the saver, or the taxpayer. 9. Suggestion would be to restrict savings to £5k pa (EE and ER) with PTR on top at marginal rate. Allow backdating for several yrs (7) for those who have not utilised. 10. I think keeping Marg Rate Tax is fair as saver MAY have to pay tax at that rate when retire. 11. There would be -ve aspects in terms of job losses or salary cuts in Fin Servs BUT if we don't subsidise steel, coal, ships etc etc why should financial sector be propped-up?